We’d love your help. Let us know what’s wrong with this preview of The Ceremonies by T.E.D. Klein. "The tree was dead, But crouched amid its branches something lived: something older far than mankind. Something that breathed, schemed, felt itself dying and, dying, lived on. It was outside nature, and alone. Its time would come..."
Jeremy Freirs had decided to spend his summer in quiet seclusion on the Poroth's farm in Gilead. It was the perfect place to catch up on his r "The tree was dead, But crouched amid its branches something lived: something older far than mankind. Something that breathed, schemed, felt itself dying and, dying, lived on. It was outside nature, and alone. Its time would come..."
Jeremy Freirs had decided to spend his summer in quiet seclusion on the Poroth's farm in Gilead. It was the perfect place to catch up on his reading, maybe even prepare for the course he'd be teaching next term. To spend a summer among books: it was an appealing prospect. Sarr and Deborah Poroth were a strange couple, like all the rest of Gilead's strict religious sect. And Sarr's mother was weird. They said she had visions. He'd keep himself to himself. There was always Carol, the red-haired, virginal beauty he'd just met. Manhattan was only ninety minutes away. She could come down for weekends. Yes, it was going to be a fine summer. To ask other readers questions about The Ceremonies, please sign up. It is always so helpful ”The tree was dead. But crouched amid its branches, hidden by a web of smoke still rising from the earth, something lived: something older far than humankind, and darker than some vast and sunless cavern on a world beyond the farthest depths of space. Something that breathed, schemed, felt itself dying and dying, lived on. Edited TWILIGHT ZONE MAGAZINE back in the day (I subscribed from the first issue) and wrote a passel of short stories which, in my limited reading experience, I found "accomplished" but did not completely grab me - with the exception of "The Events At Poroth Farm", which he later expanded into this novel right here. Klein's short fiction stands out in my mind for a singular reason - of an endless slew of horror writers referencing Lovecraft for inspiration through the decades, Klein was the first to make gestures towards engaging Lovecraft's dubious racial attitudes (although - let me phrase this correctly - not in a critical way, more as a background element). I feel this is a pretty solid "3 stars" novel. Yes, it expands on "Poroth" and if you've read that, you may find it a bit drawn out because you've already experienced these "events" in a more focused form. This is not an inherent fault of or flaw in the novel, however, just part of the path by which it was conceived which must be taken into account. The book is not without its strengths and not without its weaknesses. I'll get to those in a moment. Basic plot - Divorced College lecturer Jeremy Friers takes a summer rental in the wilds of Northern New Jersey (my home state!) to do research on the Gothic novel. The rental is located on the farm of a simple, God-fearing couple (Sarr & Deborah Poroth) - members of the small town's Christian fellowship sect (think Amish or Mennonites). As the summer progresses, the farm and its occupants gradually begin to fall under sway of an encroaching corruption that disrupts their lives. Meanwhile, in a parallel thread, a virginal young woman (Carol) is manipulated by a charming but creepy old man (Mr. Rosebottom, aka "The Old One") into eventually taking a role in the events (the titular "Ceremonies") which he is orchestrating out on the farm. There's a bit of Harvest Home here, with the isolated rural religious community observing, and being observed by, an outsider. There's also a bit of Rosemary's Baby in Mr. Rosebottom's recruitment of the unwitting Carol. The book's main strengths lie in its character depth and its commitment to a methodical, atmospheric, slow-burn deployment of the threat. Events accrue in a slow, detailed manner (much as the enacting of the "Ceremonies" themselves must be approached), eventually tipping from disturbing detail to acts of aggression to apocalyptic happenings. There's two things to be said about this later point. First, that may not be what some readers want from a horror novel - no implicit judgment in that, just a statement of truth. There are lots of ways to write a novel and lots of ways to write a horror novel and not all of them work for everyone. This is complicated by the second point, however - which is that even by the standards of someone like me, who is totally willing to go along with this approach, the book drags a bit at the beginning and the climax is somewhat underwhelming relative to that slow build. It is, after all, Klein's first novel. The book's weaknesses, thus, lie in its methodical approach eventually culminating in a sequence which - while certainly horrific in some sense (I found the literal "Yin/Yang" symbolism of the climactic altar scene visually disturbing) and suitably pulpy (roaring fires, flowers with teeth, towering mounds, an altar, a monster, an earthquake, etc.) - was also kind of familiar and in which the ultimate problem is "solved" somewhat too easily. There's another aspect which some seemed to have a problem with - the removal of the primary antagonist from the book at about the four/fifths point through a manner which some found too incidental. I actually thought that while it could have been specifically handled in a slightly better way, the actual event was not incongruous as the book had explicitly made the point earlier that the forces working for "evil" were just as fallible as the unwitting pawns - wisdom, small magics and an awareness of vast plots and powers do not necessarily overcome hubris, lazy planning and impetuousness in other words. The characterization is another crux on which the book both rises and falls. The methodical approach allows for an extended examination of the main characters and I felt they came across as well-rounded and realistic, bearing both positive and negative qualities like most people (thus, some find them "unlikeable") and balancing each other (the basic quartet dynamic - the atheistic academic, the friendly but pious farmer, his equally pious but slightly more sensuous wife, and the virginal but worldly love interest -is nicely done). Unfortunately, for plot reasons, one of those characters is not afforded an internal monologue like the rest and when you pick up on this, you can begin to see where the story might be going. Actually, the carefully built character attention generally tends to fall apart near the end of the book, and not merely because of those plot turns I mentioned - in particular, Sarr's visionary mother basically disappears (I think it may be intended that we presume she's killed) and Carol, a major character and focus of equal-time attention at the start of the book, basically has her role diminished into that of a wordless prop by the end. Some reviewers also question the wisdom of making Mr. Rosebottom a main character as well, seeing as he is the agent of an alien, ancient evil - but I actually kind of liked this, and the small moments of rushing and mistake nicely "humanized" what is an essentially unknowable character in such a way as to make his efforts seem like "efforts" - instead of some inevitable cosmic conspiracy - and thus his downfall seems more plausible. "Truman Capote as servant of Yog Sothoth" was how I pictured him. Of course, there's also the expected references to classic works of horror (a nice little moment replicates an image from Green Tea by Joseph Sheridan Le Fanu - and there are others), with Arthur Machen's "The White People" the primary touchstone. That may seem like an odd choice as the power of that tale comes from the observation and inculcation of ancient cultic/occultic practices as filtered through the language and worldview of a young girl - and any explication of those ominous mysteries might serve to undermine them rather than elevate them. And yet Klein does a good job with these mystery cult practices, making them symbolic and resonant without rendering them too formulated and deterministic. Really, this is an essentially flawed but sometimes rewarding work - perhaps showing that Klein just didn't have it in him to commit to the novel structure in a satisfying way. He does a very good job with landscape and environment description, bringing the setting to life through repetition and attention to varied details. There's also some nice grace notes - Sarr Poroth's long description of his one and only visit to New York City (Manhattan sketched in realistic but cold and brutal terms as viewed by a deeply religious man) is very powerful - this scene is followed by the initial encounter with and discussion about the mysterious, Tarot-like "Dynod" deck, with its ominous and unnerving (yet oddly simple) imagery. And the whole sequence culminates in a fitful night of creepy and evocative nocturnal trance actions which cause time itself to "slip a groove". I also enjoyed the sequence with Carol at her dance class, as her fellow students unwittingly fall under the sway of the folk-magic dance she's been taught. But there's also missed opportunities - the ending feels rushed and I thought that more would be made of such magical/psychological training as the visualization and "what if" games - it seemed likely they would figure into the climax, allowing the evil an opportunity to manifest in a more powerful form, but such was not to be. Dread is a word you don't see used much in association with horror fiction any more. And it's a shame, because used properly, slow building dread can be more horrific than any gore or bloodletting. Fortunately, there are writers who understand this, and one of the best examples can be found in THE CEREMONIES, which starts slow, gets slower, but accumulates dread along the way like a wool suit collecting cat hairs. And it's a marvel of timing, precision and skill, with its cast of great characters Dread is a word you don't see used much in association with horror fiction any more. And it's a shame, because used properly, slow building dread can be more horrific than any gore or bloodletting. Fortunately, there are writers who understand this, and one of the best examples can be found in THE CEREMONIES, which starts slow, gets slower, but accumulates dread along the way like a wool suit collecting cat hairs. And it's a marvel of timing, precision and skill, with its cast of great characters all circling around the central motifs, each of them catching glimpses of the whole but none completely understanding what they are being shown, or why. It's also a remarkably timeless book. It was written before laptops, before cellphones and email, but by setting it mostly in a remote rural farmscape, it feels older still, and its throwbacks to genre giants like Lovecraft and Machen in particular seem to root it even farther back in time again. The slow build, taking care and attention to let us get to know, if not like, the main characters, gives their respective fates at the climax emotional resonance, and a depth thats often lacking in fiction in the field. The writing itself is rich and lyrical, the handling of viewpoint and control of pacing is expertly done, and the book is one of the wonders of modern weird fiction. It's a shame Klein hasn't produced more over the years, but kudos to PS Publishing for the fine new paperback edition I read this in, which is a lovely piece of packaging for a book that deserves to be showcased. This is the best "Lovecraftian" novel I've read. The first third of the book is rather slow, some parts feel like they could have been discarded, but Klein establishes a good sense of place and slow-building atmosphere. He doesn't try to scare us much to start with, but later when he wants to he does an excellent good job of it while maintaining more subtlety than most modern horror. Some scenes are quite scary; the "old woman in the elevator" scene, the "rose with teeth" dream sequence and many This is the best "Lovecraftian" novel I've read. The first third of the book is rather slow, some parts feel like they could have been discarded, but Klein establishes a good sense of place and slow-building atmosphere. He doesn't try to scare us much to start with, but later when he wants to he does an excellent good job of it while maintaining more subtlety than most modern horror. Some scenes are quite scary; the "old woman in the elevator" scene, the "rose with teeth" dream sequence and many others which become more numerous as the story goes along. And this is coming from a person who loves horror, but is pretty jaded and rarely unnerved by a book. The story takes place in two primary locales, the small New Jersey village of Gilead and New York -- the parts in the city are often less interesting and the novel at times has a sense of the urban vs. the rural. I thought the dialogue was decent, and the story flows well, it’s not full of eloquent Victorian language like Poe or Lovecraft and frankly a few phrases here and there feel a bit ‘novice,’ but it flows well in a comfortable way and it’s fun to read. I found myself wishing I could just go on reading it even when I really needed to go to bed (a sign of a really good book). I cared about the characters too, I found myself feeling bad when, lets just say bad stuff happens to some of them. The story gives us many points of view from the characters. The journal of Jeremy gives us those moments where we want to say “the monster is behind you!” but he doesn’t connect the dots to know what's going on. In fact, everyone remains ignorant of what's really going on until the very end. This is a very Lovecraftian tale with references to "gibbous moons" and "dhols" and other things. The story has a lot of folklore and superstitions, as well as references to classic horror stories and novels (most of which I found I'd read). Reading the critiques of the novels is pretty interesting as well. One of the few horror novels I could see myself re-reading. Llevaba tiempo buscando este libro en el mercado de 2º mano a un precio asequible. Lo encontré pero algo deteriorado. Daba igual, mas terror causaría leerlo así. Lo buscaba por la simple razón de estar considerado uno de los libros más terroríficos, y de los que acompañaban a: “La habitación de Naomi”, “the Ring”, “El canto del Cisne”, “Aquí vive el horror”. Esos libros de culto difíciles de encontrar. Me he encontrado terror, así es. Un chico busca un lugar tranquilo para ha ¡Uy! Casi 5 estrellas. Me he encontrado terror, así es. Un chico busca un lugar tranquilo para hacer un estudio de las novelas góticas (muchos referencias nos dan a estas). Lo encuentra en un pueblo retrogrado, que viven como en el siglo XIX, en una familia extraña que alquila su gallinero (único sitio acondicionado con luz eléctrica). Comenzara sus lecturas, mientras a su alrededor comenzara a suceder fenómenos paranormales. La vida de él nos la narrara en 1º y 2º persona. En otro lugar un anciano recorrerá lugares moviendo cabos para que algo suceda. Este anciano tuvo una conversación con un ser antediluviano cuando era joven, en un frondoso bosque. Por otro lado tenemos la chica solitaria, perdida, estudiosa y deseosa de amor. Que se relacionara con nuestro protagonista por los libros. Klein escribe de maravilla. Ambienta muy bien los lugares, algo fundamental en el terror. Y maneja los personajes con soltura dándoles mucha realidad. Por Dios queridas editoriales, hacer tiradas de estos autores olvidados de culto (Peter Straub, James Herbert…) Es muy barato reeditarlos y podéis hacerlo por medio de crowdfunding para asegurar no tener perdidas. A big, dull plodding novel from the era of epic-length horror works, T.E.D. Klein’s The Ceremonies is frustratingly evasive and off-putting. And while I could forgive a slow pace (some of my favorite books are slower than this), this thing is filled with unlikable, unmemorable characters. The main character, Jeremy, is especially grating as he’s so cynical and bratty. The only thing this book has going for it is its atmosphere: Klein renders the feeling of living off the beaten path, so to speak A big, dull plodding novel from the era of epic-length horror works, T.E.D. Klein’s The Ceremonies is frustratingly evasive and off-putting. And while I could forgive a slow pace (some of my favorite books are slower than this), this thing is filled with unlikable, unmemorable characters. The main character, Jeremy, is especially grating as he’s so cynical and bratty. The only thing this book has going for it is its atmosphere: Klein renders the feeling of living off the beaten path, so to speak, in a non-technological village quite successfully. I often felt I was there, in the story. It’s just unfortunate everything else is boring and predictable, and NOT SCARY. to (view spoiler)[1) Old One wants Carol to do weird thing 2) Old One tells Carol to do weird thing 3) Carol does weird thing (hide spoiler)]. I kept expecting the pattern to be a set up for a clever subversion, with Carol resisting the role that she is being forced into. That never happens. Terrific build-up of suspense for 400 pages and then...nothing happens. Up until then it was remarkably Lovecraftian and effective. Rewrite the ending, Klein, and we'll talk. All of Klein's works I have encountered (I haven't read his Reassuring Tales book) are of high quality, and this is certainly no exception, but I prefer his earlier, shorter incarnation of this story: 'The Events at Poroth Farm' . Relectura más que satisfactoria de un clásico del terror de los años ochenta (oye, qué buena literatura de terror se escribió en aquella época). Narración lenta, detallada, ambiental, con buenos personajes, que ya no suele ser muy habitual en estos tiempos... No recordaba que Machen, Lovecraft, etc. y otros colegas góticos estuvieran tan presentes en la historia. 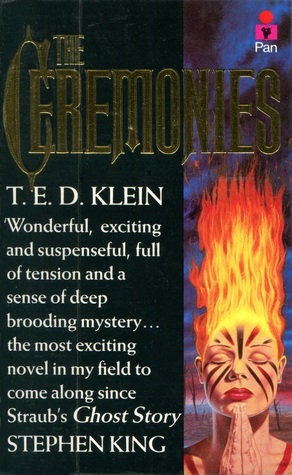 I just finished The Ceremonies by Ted Klein. It is clearly a novel that has earned its reputation as one of the finest works of Cosmic Horror ever written. It has its faults, the ending seemed rushed and a little incongruent with the rest of the book, but this book makes up for its faults in spades. This is a dense read, that doesn't mind taking trips into minutia, and gets very meta with its constant references to Machen's The White People, making that tale a part of the story itself, as well a I just finished The Ceremonies by Ted Klein. It is clearly a novel that has earned its reputation as one of the finest works of Cosmic Horror ever written. It has its faults, the ending seemed rushed and a little incongruent with the rest of the book, but this book makes up for its faults in spades. This is a dense read, that doesn't mind taking trips into minutia, and gets very meta with its constant references to Machen's The White People, making that tale a part of the story itself, as well as constant mentions of authors and their works that are now considered canon for The Weird and the Cosmic, much in the manner that Lovecraft did in his storytelling. “Then, idly scratching his nose, he walks to the bookcase in the living room and stoops before a set of drab brown Victorian volumes gathering dust on the second shelf from the bottom. How amusing, he thinks, as he withdraws one of them-amusing that a key to dark and ancient rites should survive in such innocuous-looking form. A young fool like Freirs would probably refuse to believe it. Like the rest of his doomed kind, he'd probably expect such lore to be found only in ancient leather-bound tomes with gothic lettering and portentously sinister titles. He'd search for it in mysterious old trunks and private vaults, in the "restricted" sections of libraries, in intricately carved wood chests with secret compartments.